This mousse, topped with beautiful macaroons, is perfect for a special occasion. 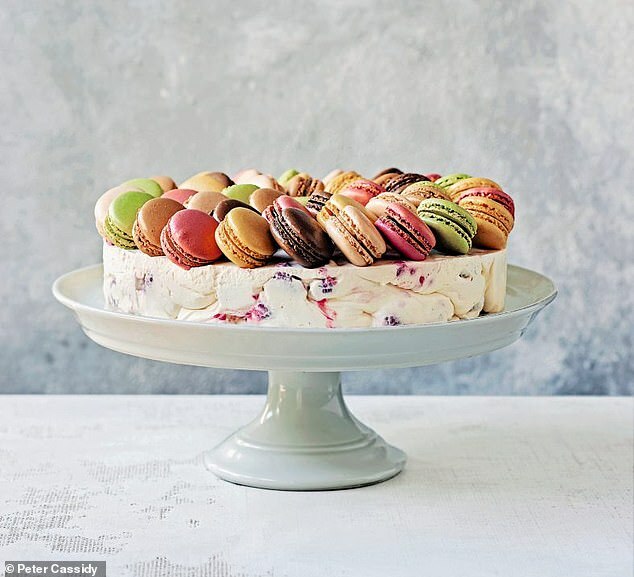 We grabbed our macaroons from Miss Macaroon in Birmingham but don’t worry, she (aka Rosie Ginday, ex-team member of Glynn Purnell’s Michelin-starred restaurant) has an online shop. It’s the only macaroon shop in the world where your macaroons can be Pantone-matched to any colour you wish. In a large bowl, whisk together the cream cheese and double cream until the cream is mixed in well. Add the lemon juice, then the full-fat crème fraîche, and continue to whisk the mixture until it just thickens. Add the raspberries and gently stir them in so that they create a really nice ripple effect through the mixture. Place a 24cm mousse ring (or use the ring from a springform cake tin) on a cake stand and spoon the mixture into the ring. Use a palette knife to level off the top, then chill for up to 1 hour. Use a kitchen blowtorch on a medium heat to heat the outside of the ring and loosen the mousse (if you don’t have a blowtorch, see tip across the bottom of the page) and then carefully lift off the ring. Arrange the macaroons evenly over the mousse to cover the top as much as possible. Slice into portions to serve.